100 years ago, a great floating city, the "Unsinkable" Titanic, filled up with ice-cold ocean water and sank. This week, my hometown, the great city by the sea, New York, was inundated by its own unprecedented flood of ocean water. As I write, the city's essential arteries - the subway tunnels, the underground power lines and steam pipes - remain flooded. The Titanic tragedy was a man-made calamity, exacerbated by perfect natural conditions (a moon-less night and calm sea). Hurricane Sandy was the ultimate natural disaster, a "perfect storm," totally transcending human control, although ameliorated by effective emergency planning and activist government at both local and federal levels. Watching the images of disaster unfold on TV this week, one naturally worried about one's family and friends. So, during the storm itself, I called the Paulist Mother House in mid-town Manhattan - relatively unscathed compared to those in more exposed areas of the city or the Jersey coast. My relatives scattered throughout Westchester, Manhattan, Long Island, New Jersey, and Pennsylvania all lost electric power, but are otherwise OK.
September 11 made New Yorkers acutely conscious of vulnerability and interdependence. This apocalypse, however, came not from an act of war but rather weather. One of the reasons we all like to talk about the weather and complain about it is because we can't control it. It's just there. At best, most of the time, we comfort ourselves by taking shelter from nature's fury. Hurricane Sandy has reminded us how ephemeral our shelters are, how vulnerable the structures we rely upon, how interconnected and dependent we are on one another, how helpless we are alone, how desperately we need government to keep us together and marshal our common resources for the common good. Sandy's wind, rain, and snow continue to spread north and west and south. Even at this distance from the coast, we see snow in the Smoky Mountains and rain here in the valley. No one is immune from nature's terror. Guns don't defend us, and profits sink under the floods. Now I’ll be the first to admit that this is something that interests only a very miniscule segment of the world’s population. And, compared to the impending Storm of the Decade or even our national election, I'll readily also admit that it really ranks way down on the scale of ultimate importance. Still, I am happy to number myself among those who rejoice in Pope Benedict XVI’s recent restoration of the Fanon at Solemn Papal Mass at St. Peter’s. (The Pope wore it for the first time a week ago at the Mass for the canonization of seven new saints). The use of the Fanon dates back at least to the 8th century and was used continuously at solemn Papal Masses until the dismantling of the papal liturgy several decades ago. 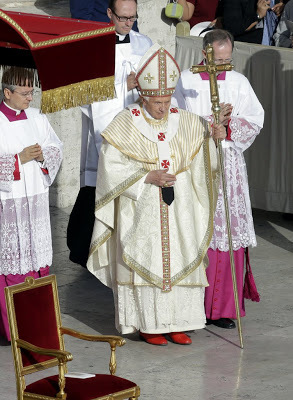 The Fanon is essentially a kind of circular shoulder-cape (kind of like a mozetta) worn by the pope alone, consisting of two pieces of white silk ornamented with narrow woven stripes of red and gold. There are, to my mind, two good reasons to celebrate this restoration of the Fanon. The first is, simply put, tradition. All ritualized behavior - social, political, religious - incorporates aspects that are of limited or no present practical purpose, but which are retained simply because they signify continuity with the past. To be clear, there was certainly much that was good and beneficial in the late-20th-century liturgical reforms, but a certain rationalistic tendency crept in along with the good and beneficial – a rationalistic tendency that evidenced little appreciation of what ritual really is. In the end, of course, a totally rationalized liturgical ritual is inconceivable. Just as we still light candles on the altar, even though electric lighting is available, traditional actions (and vestments) from the past remain an important component of liturgy. Of course, some inherited traditions do get changed over time and for good reasons. For example, the offensive omission of the Flectamus genua in the Good Friday Prayer for the Jews was rightly corrected by Pope Pius XII in 1955. But, when change is not really needed, then it is generally better not to change. That is because continuity itself has a social value – and nowhere more so than in the liturgy, in which we are being united with all the People of God, not only of every place, but of every time. Vestments, as the papal MC, Monsignor Guido Marini, is supposed to have said some years ago, “aim to underline the continuity of today's liturgical celebration with that which characterized the life of the church in the past." So retaining (in this case restoring) the use of traditional attire highlights the continuity of the Roman Rite and symbolizes the Church’s present connection with the Church of ages past. The second reason why I think the restoration of the Fanon is a good move is that it highlights the distinctiveness of papal liturgy. Another oddity of the late-20th-century liturgical reforms was the tendency to assimilate papal ceremonial to ordinary pontifical ceremonial. Of course, the Pope is first and foremost a Bishop. So papal ceremonial should rightly be recognizable as indeed a case of pontifical ceremonial – but still a special case. A Papal Mass is not just a Pontifical Mass in a larger than usual venue with a larger than usual crowd and extra security! Pilgrims who attend a Papal Mass attend precisely because it is special (which is why they are willing to put up with all the security and other inconveniences which nowadays accompany such ceremonies). In this age of increasinlgy casual attire, we may perhaps be in danger of forgetting that how one dresses for an occasion says something significant about the importance of the occasion and about one's own understanding of one's role. It seems especially significant that the Fanon reappeared at a canonization - one of the most solemn and authoritative papal acts. Distinctive papal vestments are one small, but observable addition which highlights the specialness of the papal office. Most people (at least most of the time) try to ignore beggars as much as possible. That’s easier to do perhaps when one goes everywhere by car, where we just pass people by, without paying them much attention one way or the other. It’s more of an issue in a walking city, such as where I come from. And, obviously, Jesus and his contemporaries lived in a walking world, where one walked almost everywhere – to go almost anywhere – where just passing by without necessarily either noticing or ignoring was really not an option. My guess is that most people in Jericho generally ignored Bartimaeus as much as possible. The fact that we now know his name (one of the very few people Jesus healed whose name we know) might mean that he later become a familiar figure in the early Church. But that was way off in the future that fateful day that Jesus passed through Jericho with his disciples and a sizable crowd [Mark 10:46-52] – an exciting glamorous occasion for the locals, not unlike a presidential candidate’s campaign event. Perhaps fearing he’d not otherwise be noticed, Bartimaeus cried out, “Jesus, Son of David, have pity on me.” He had to make a nuisance of himself – just to get noticed at all! The crowd, of course, tried to shut him up – until Jesus did just the sort of thing he was becoming famous for doing. No doubt to the chagrin of his disciples, who were probably enjoying the parade and their part in it, Jesus stopped to pay attention to some nobody – reaching out (as Jesus so often did) across the boundaries that are supposed to keep people in their proper places. Had Jesus actually been a modern political candidate, presumably he’d have had an advance man – or team of advance men – precisely to prevent such things from happening! Notice, however, how quickly the crowd got with the program. Unscripted events have a certain popular appeal all their own. As soon as the people realized that Jesus was actually interested in Bartimaeus, suddenly their scolding turned to encouragement. Jesus’ question, “What do you want me to do for you?” was the same question he had asked James and John in the Gospel we heard last week. But what a difference in response! The answer they gave was what one would expect form two young, talented, upwardly mobile disciples, just beginning their careers. Poor Bartimaeus simply said, “I want to see.” Unlike James and John, Bartimaeus wasn’t on some fast track to anywhere. He was, in fact, on a very slow track to nowhere, and he knew that perfectly well. Beggars, it is said, can’t be choosers. So they ask for what really matters. James and John’s request reflected their greed. Bartimaeus’ request reflected his need. In his closest companions and dearest disciples, Jesus found demanding ambition. In Bartimaeus, he found faith. The story could have ended right there. But, in spite of Jesus’ instruction, “Go on your way,” Bartimaeus did no such thing. Instead, we are told, he followed on Jesus’ way. Having himself found healing and salvation, he wanted to share what he had found with others. Bartimaeus seems to have immediately understood what so eluded James and John – what James and John and the other disciples, for all their quality time with Jesus, still so failed to understand – namely, that God’s gifts are given not just for ourselves, but are meant to be shared with the whole world, this world which God loves so much that he has chosen to become a part of it. This applies in all aspects of our lives. As the saying goes, "when you walk through that door of opportunity you don't slam it shut behind you." And it applies, of course, specifically in our calling as Christian disciples. Like Bartimaeus, Saint Paul understood this. If I preach the gospel, this is no reason for me to boast, Paul famously wrote to the Christians in Corinth, for an obligation has been imposed on me, and woe to me if I do not preach it! And, like Bartimaeus, all of us have been changed – and challenged – by the transforming power of Jesus Christ in our lives. Like him, we too now have to live that change, in our ordinary everyday lives as believers, in the wide and complicated variety of situations in which we find ourselves – as family members, students, workers, and citizens. Of course, it’s easy to settle for less. It’s always tempting to be satisfied with who’s in and who’s out. The crowd in Jericho was content to keep Bartimaeus quietly on the side of the road, quite literally in the dark. But, by not playing his prescribed part, Bartimaeus enabled them to experience truth and grace way beyond the limits of their expectations – truth and grace to be shared with all – the only alternative to a future spent in darkness. In the dark, Bartimaeus represents where we are on our own. Following Jesus, Bartimaeus exemplifies the community we can become through the healing, forgiving, and transforming power of Christ present and active in our world. The crowd in the Gospel got the message. Once they realized what Jesus wanted, they stopped hindering Bartimaeus and instead helped him to follow Jesus. The truly happy ending of this story will be when we too do the same! Homily for the 30th Sunday in Ordinary Time, Immaculate Conception Church, Knoxville, TN, October 28, 2012. This Sunday, will mark the 17th anniversary of my ordination as a priest. I was ordained on October 28, 1995, by the Most Reverend Attila Mikloshazy, S.J., Bishop for the Pastoral Care of Hungarian Emigrants and also Dean and Professor of Liturgy and Historical Theology at St. Augustine’s Seminary, Toronto. The ordination took place at St. Peter’s Church, the Paulist parish in Toronto. Five years later, in 2000, after serving as Associate Pastor at St. Peter’s and as Associate Director of the Paulist Center for Catholic Evangelization in Toronto, I returned “home” to New York City, where I served for 10 years (under four different pastors) as Associate Pastor at the Paulist “Mother Church,” St. Paul the Apostle in mid-town Manhattan. Then in 2010 I was appointed 24th pastor of Immaculate Conception Parish here in Knoxville. 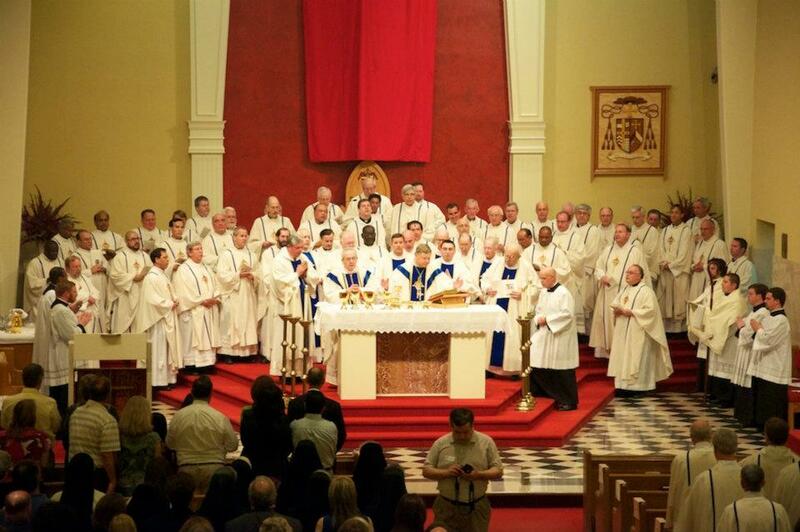 (The above photo is from the 2012 Chrism Mass at Knoxville's Sacred Heart Cathedral). It has been an amazingly wonderful 17 years. Like most priests, I would not wish any other career for myself (although my brief, earlier “first career” as a political scientist was in its own way certainly also an experience worth having had). Like most priests, I probably find my greatest joy in celebrating the sacraments and faciitating parish life. In fact, recent studies have shown that over 90% of priests agree that they are happy as priests, and over 80% say that their morale is good. Those are good numbers for any profession! Yes, the priesthood is a very satisfying vocation. That is certainly a good thing, given that the priesthood is so central to the Church’s life and so essential to its mission. Yet, as we all know, the overall number of priests has been declining and their average age increasing in recent decades, even as the number of Catholics has continued to grow. In 1965, there was one priest for about every 800 Catholic lay people. By 2007, it was one priest for every 1550. Nationwide, ordinations are about one-third what would be needed each year to keep the number of priests constant - not to increase the number of priests to meet the growing needs, but just to keep the number constant! Meanwhile, the Catholic population in the U.S. continues to grow – in absolute numbers, although not as a percentage of the population. The growth in the American Catholic population has been largely the result of immigration, which has counterbalanced the opposite tendency of many American Catholics to abandon the faith. The result is that the percentage of Catholics in American society has managed to remain relatively constant at about 24%. Besides being the 17th anniversary of my ordination, Sunday, October 28, is the 1700th anniversary of a much more historically significant event – the Roman Emperor Constantine’s victory over his imperial rival Maxentius at the Battle of the Milvian Bridge, just north of Rome. What made that event significantly different from any of the many other battles over imperial succession was, of course, what happened after. According to the received accounts, when the victorious Constantine entered Rome in triumph the following day, he omitted the customary concluding visit and sacrifice at the Temple of Jupiter. Whatever that act may have been understood to mean in its immediate context, subsequent events invested it with profound meaning, for it was followed a few months later by the famous Edict of Milan, making the practice of Christianity legal in the Roman Empire - and setting the stage for Christianity eventually to replace classical paganism as the religion of the Empire. The traditional accounts also credit Constantine’s victory to a vision the previous night. Whatever he actually experienced that night, the result of Constantine’s victory was not just imperial toleration of Christianity but increasing imperial embrace of Christianity. As emperor, Constantine constantly concerned himself with Church affairs, contributing greatly to the long-term Christianization of Roman society – for example, making Sunday a legal holiday in 321, convening the Council of Nicea in 325. In the process, he set in motion the complicated Church-State entanglement that has characterized Western societies and states until our own time. But it wasn’t just the Roman Empire and Roman society that changed profoundly. So did Christianity – at least as regards its self-understanding vis-à-vis the State. Jesus himself, of course, had acknowledged the legitimacy of civil authority and the obligation to pay taxes. St. Paul taught that political authority derived from God, and that obedience to lawful government is necessary not only because of wrath but also because of conscience. For the same reason you also pay taxes, for the authorities are God's servants [Romans 13:5-6]. The 1st Letter of Peter commanded: For the Lord's sake accept the authority of every human institution, whether of the emperor as supreme, or of governors, as sent by him to punish those who do wrong and to praise those who do right [1 Peter 2:13-14]. 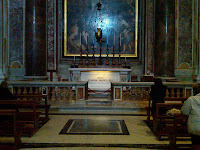 To his disciple Timothy, Paul urged that supplications, prayers, intercesions, and thanksgivings be made for everyone, for kings and all who are in high positions, so that we may lead a quiet and peaceable life in all godliness and dignity [1 Timothy 2:1-2] - a sentiment echoed a century or so later by Tertullian (c. 160-220), who called for prayer for emperors, their ministers, for the condition of the world, for peace everywhere, and for the delaying of the end [Apologeticus, 39]. All this referred, however, to what would eventually come to be classified as legal justice - i.e., the obligations which citizens owe to society. But what about the moral obligations of political society and the duties of statesmen? Notwithstanding early Christian respect for the State, the early Christians simultaneoulsy saw the State as something "other." St. Paul, for example, famously (and forcefully) forbade using secular courts to solve disputes among Christians [cf. 1 Corinthians 6]. While there were certainly some cases of Christians who were soldiers and perhaps even some other public officials here and there, involvement with the pagan state was presumptively problematic - inhenrently implicated as it was in pagan cult. Then, all of a sudden soemthing hapopened that no one had really expected or prepared for. The Emperor himself became a Christian. Soon enough, the entire governing apparatus of the Empire (and of the successor states that followed its "fall") was in Christian hands. Suddenly, how a Christian governs, the duties of a Christian officeholder, and the obligations of Christian statecraft became salient moral issues. And so they have remained ever since. There remain marginal, sectarian branches of Christianity which try to maintain a strict separation between themselves and the State, remaining as aloof as possible from politics, resisting military service, compulsory education, etc. For the rest of us, however, there is the unavoidable challenge of figuring out how to be at one and the same time a fully engaged citizen of the secular State while remaining faithful - in public as well as in private - to the unique obligations of being a member of the Body of Christ. For all the talk about religion in this current election cycle, this challenge has been at the heart of Christian life in the world ever since Constantine's politically game-changing acceptance of Christianity. Every now and then, anxiety about the Electoral College surfaces as a popular preoccupation - at least among those whose vocation (or avocation) is to be preoccupied about such things. Such anxiety is gaining traction again as we face the prospect of a very close election in which one of two terrible things could conceivably happen. First, the winner (with a majority of the electoral vote) might fail to win at least a plurality of the popular vote. This has happened before, and the Republic has survived. It happened in 2000, but was overshadowed (in popular attention) by the conflict over Florida's electoral votes and the Supreme Court's hijacking of a matter which the Constitution clearly leaves for Congress to adjudicate. Second, (and to my mind much scarier), the election could result in a 269-269 tie, leaving it for the newly elected House of Representatives to choose a President in January. Since the House would vote by states - each state having an equal vote - it is generally assumed that Romney would win in such a scenario. Meanwhile, the Senate (voting as individuals) would choose the Vice President. The likely result would then be Romney as President and Biden as VP - a cohabitation likely to be as unhappy as that of our second President and Vice President, John Adams and Thomas Jefferson. While the second scenario remains unlikely, if it happened it would most certainly result in popular demands for fixing the way we elect our presidents. The main popular argument against the electoral college is that it violates our modern obsession with one-person, one-vote. Of course, the electoral college comes from a time and a theory of political representation different from current political correctness. The question, then, is whether current political correctness ought to trump other and older ideas. There are many political institutions which reflect other times and older values, which would not be put in place today were we starting from scratch. But, of course, societies seldom start form scratch - and when they try to (e.g., the French Revolution and the Russian Revolution) the results are overwhelmingly frightening. The Burkean in me starts with a presumption in favor of existing constitutional arrangements and asks whether the supposed advantages of making a change outweigh the potential disadvantages. Sometimes, certainly, it is necessary to make a constitutional change. (The 13th, 14th, and 15th amendments to the constitution are good examples). But, to borrow Chesterton's famous phrase, if it is not necessary to change, then it is necessary not to change. The Electoral College has, among other things, helped institutionalize our two-party system, which on the whole has served us well. On the other hand, it has the unfortunate result that in any given state a vote cast for the losing candidate counts not at all. This translates further into diminished attention to those states by the candidates. The entire campaign focuses on the small number of so-called "swing states." Of course, not so long ago there used to be a lot more states in play - including such big states as New York and California. That there are now so few "swing states" is itself a consequence of the extreme polarization of our politics - and the growing geographical segregation of Democrats and Republicans. There are serious institutional roadblocks to effective governance - e.g., the filibuster (which is not in the constitution and could be changed easily, were there any political will to do so). In the larger scheme of things, the electoral college ranks low on my list of obstacles to effective governance. On the other hand, the cultural polarization that effectively reduces the campaign to only a small number of states certainly should rank high on any such list. While I am content to accept the constitutional legitimacy conferred on the winner by the electoral vote, I do, however, think that the right popular vote outcome contributes mightily to a president's political (as opposed to constitutional) legitimacy. In a close race like this one, even though one's vote may not constitutionally "count" in most states, still for the sake of popular vote legitimacy an important case can be made for voting anyway. and that is one reason why I will be voting in this election. On retreat with the Bishop and priests of the Diocese at beautiful Lake Junaluska, immersed in natural beauty in all its autumnal glory, this would not seem to be the right setting for anxiety of any kind. On the other hand, perhaps, perhaps the contrast makes the anxieties of life appear that much more stark. After all, didn't our retreat master himself begin by reminding us that we bring our demons with us on retreat? Coincidentally - or providentially - the scripture reading in today's Office is Esther 14:1-9, the famous "Prayer of Queen Esther," when, after hearing her Uncle Mordecai's news about the impending thereat to the survival of the Jewish People, Queen Esther, seized with mortal anguish, had recourse to the Lord. To highlight the seriousness of the crisis, the text tells us she took off her splendid garments (she was a queen, after all) and put on garments of distress and mourning. That's a nice nostalgic reminder that there once was a time - until quite recently in fact - when people dressed appropriately for the occasion, before the current tyranny of casual dress overwhelmed everything, driving yet one more nail in the coffin of civilized living. Esther's prayer is desperate, for the situation in which the Jews found themselves thanks to Haman's genocidal ambitions, was indeed a desperate one. It is also poignantly universal, expressing the sensibility of everyone who has ever felt threatened, alone, and abandoned. "My Lord, our King, you alone are God. Help me, who am alone and have no one to help but you, for I am taking my life in my hand. ... O God, more powerful than all, hear the voice of those in despair. Save us from the power of the wicked, and deliver me from my fear." Esther's prayer is one which could be prayed by anyone is serious angst about any impending evil - personal and private or political and public. The threat immediately facing the Jewish People was, of course, a political one. Hence the significance of Esther calling God Israel's King - presumably in contrast to the merely earthly sovereign whose royal rank she shared. But, while Esther seems to speak somewhat disdainfully of her royal (but Gentile) husband in her prayer, she is also well aware that it is her royal position which may be the means for her people's salvation. As her Uncle Mordecai himself had told her: "Who knows but that it was for a time like this that you obtained the royal dignity?" The story of Esther reminds us that life is always dangerous, that threats abound on all sides, that feeling endangered and threatened, alone and abandoned, may be the just person's natural state in this vale of tears. But it teaches - and that is after all the point of the story - that God's providential care for his people is infinite and manifests itself in surprising ways. And it teaches us not to disdain the natural, human opportunity's social and political life affords us to benefit from God's providence in the here and now. On the 50th anniversary of the Monday evening in 1962 when JFK broke the news of the Cuban Missile Crisis to an anxious nation, his 9th successor and wanna-be 10th successor fought it out on TV together one more time. So addicted are we now to politics as entertainment that the first reaction of some was that the debate was boring. Of course, foreign policy ought to be boring in that - now as in 1962 - it deals with serious stuff. But, yes, it was also boring in that the two candidates used their time to rehash their standard talking-points. And, in an election in which it is widely believed that voters are motivated primarily about the economy, neither could resist the opportunity to change the subject back to his domestic agenda - or to the critique of the opponent's domestic agenda. And, of course, Governor Romney repeated his counter-factual, nonsense-jingle about President Obama's "apology tour." Each side has its predictable applause lines that cheer up its base voters - regardless of relevance. Perhaps when this is all over both guys should go on an "apology tour" expressing contrition to the American people for the vacuous tedium of their talking-points when so many serious matters really are at stake in this election. Perhaps it is true that the voters aren't that interested in foreign policy. Perhaps that's all part of the same syndrome that causes Americans not to learn foreign languages and to expect everything everywhere in the world to be done in English. But foreign affairs are important - and never more so than in this inter-connected, "globalized" age. The threat of an Iranian nuclear weapon may nto be quite on the same scale as Soviet missiles in Cuba in 1962, but it's up there in seriousness. Whoever is president on January 20 will face many challenges both to our own national security and that of our allies (especially Israel), not to mention the long-term challenges to craft a functional balance of power in the world that can maintain an effective degree of international order and facilitate addressing global threats like climate change. Today the Catholic Church in East Tennessee commemorates Blessed Pope John Paul II, "Secondary Patron" of the Diocese of Knoxville. (The photo shows his tomb in St Peter's Basilica, now one of the most visited shrines in the vatican Basilica). So far as I know, the only special connection Blessed Pope John Paul had with the Diocese of Knoxville was his having been Pope when the Diocese was founded 24 years ago in 1988. His impact on the Universal Church, however, was enormous. There was, of course, his influential role in the transformation of the Eastern Bloc and the collapse of the Soviet Empire. There was his strong commitment to strengthening Catholic-Jewish relations, reflected in the Holy See's long overdue diplomatic recognition of Israel. Above all, there was the recovery of confidence at all levels of Church life. After a period in which it seemed as if the Church was losing its way and was giving up (at least in the West), the new Pope from the East recalled the Church to its essential mission and restored some of the confidence that seemed to have dissipated in the previous decade. John Paul set the tone for this revival of confidence right at the beginning of his pontificate - in his homily at his Inaugural Mass, the text which is so fittingly read in today's Office of Readings: Do not be afraid. Open, I say wide the doors for Christ. to his saving power open the boundaries of states, economic and political systems, the vast fields of culture, civilization, and development. Do not be afraid. One of my favorite movies from the early 1990s that I enjoy seeing over again is Quiz Show - a film about the TV Quiz Show scandal of the late 1950s. Being old enough to remember the actual events, the movie’s main initial appeal for me when I first saw it was largely nostalgia. Beyond nostalgia, however, every time I see the film, I’m impressed by how well it portrays a certain social pecking order that virtually everyone (especially those less favored in that hierarchy) accepted and affirmed. Thus, the hero, Richard Goodwin, is portrayed as so mesmerized by the very personification of status and privilege, Charles VanDoren, that he goes out of his way to try not to have to hold him accountable for his dishonesty, while less glamorous (and hence less favored) characters are depicted as so much less deserving of sympathy. Clearly, rich and prominent people just feel entitled to their privileged status, and the less privileged accept this and often cater to it. Of course, to know that about our society, one need only tune in the news. When it comes to human behavior, there really does seem to be nothing new under the sun. In today’s Gospel [Mark 10:35-45], Jesus has again just told his disciples what lies in store for him when he gets to Jerusalem. The 1st time Jesus did this, Peter had tried to talk him out of it, prompting a severe reprimand and a no-nonsense instruction on what being a disciple really means. The 2nd time, the disciples did not understand and were afraid to ask him. Instead, they argued among themselves, discussing which of them was the greatest. When asked by Jesus what they had been arguing about, they remained silent, which suggests at least some sense of embarrassment. This time, however, with no hint of embarrassment, James and John, two of Jesus’ most favored disciples (and thus the ones most especially susceptible to an attitude of entitlement), responded to Jesus’ 3rd prediction of his impending death, with their startling request to sit with him in glory, one at his right and the other at his left. Apparently, the other 10, neither accepted nor were willing to cater to the status hierarchy proposed by James and John. Jealousy (as Britain’s Queen Alexandra famously said some 102 years ago) is the source of so many problems in life. So, the 10 became indignant when they heard this – their jealous indignation prompting in turn yet another instruction from Jesus, clarifying both what his life was about and what that of any would-be disciple of his must therefore also be about. What makes this incident so fascinating is the brilliant way Jesus handled his hard-to-teach disciples – both the 2 ambitious brothers and the 10 jealous others. Jesus was obviously a very good teacher. He recognized his disciples’ natural ambition. Rather than just condemning them outright, he affirmed their ambition and then gave it new content. So you want to be great, Jesus tells his disciples. Okay, then, be great – but not by imitating all those powerful, prominent people you all admire & envy so much, but by imitating me. “For the Son of Man did not come to be served but to serve and to give his life as a ransom for many.” How’s that for an ambition to aspire to, an accomplishment to envy? If following Jesus as his disciple, as a Christian, is to have any real meaning in this world, Jesus is telling us, then it must be different with us from the way it is with the rest of the world. Among other things, it means siding with those whom Cardinal Dolan at this past Thursday’s annual Al Smith Dinner in New York called the uns - "the un mployed, the uninsured, the unwanted, the unwed mother, the innocent fragile unborn baby in her womb, the undocumented, the unhoused, the unhealthy, the unfed, the under-educated." By his own life - and above all by his death - Jesus illustrated that by showing how different it is with him from the way it tends to be with us. Our task is not to analyze the world, which is just being the way the world is, but to change the world, by changing ourselves – confidently approaching the throne of grace to receive mercy and help from our great high priest who has similarly been tested in every way, yet without sin [Hebrews 4:14-16]. Homily for the 29th Sunday in Ordinary Time, Immaculate Conception Church, Knoxville, TN, October 21, 2012. The Cardinal Archbishop of New York took a break from the Synod of Bishops last night to host the annual Al Smith Dinner, New York's premier (and prestigious) fundraiser for Catholic Charites. Sharing the dais with him were the two candidates for President of the United States, each of whom acquitted himself well in the Al Smith Dinner's tradition of self-deprecating funniness. If, just a few nights earlier, the two had at times overly resembled two overgrown boys, two rivals strutting in the school yard, playground, or streetcorner, last night their presence and demeanor recalled a more civil, more humane style of politics - a style rooted in the recognition (articulated by each of the candidates) that there really are much more important things than politics. Each candidate acknowledged the other's primary identity as a husband and father - something far more important even than being a president. The star speaker of the night, however, was the Cardinal himself, who suggested that the Al Smith Dinner shows both the country and the Church at their best and spoke of how faith "affects everything we do, and dare, and dream." In keeping with the customary expectation that speakers should also act like stand-up comedians, he dutifully poked fun at his weight, suggesting he'd have looked better on the dais if Chris Christie had been the Republican nominee and would be in better shape today if Michelle Obama had been 1st Lady when he was growing up. Powerfully evoking the memory of Al Smith himself, however, His Eminence identified the Church squarely in the side of those he called the "un-"s - "the unemployed, the uninsured, the unwanted, the unwed mother, the innocent fragile unborn baby in her womb, the undocumented, the unhoused, the unhealthy, the unfed, the under-educated." Then he added "Government, Al Smith believed, should be on the side of these 'un-'s, but a government, he also believed, partnering - partnering with family, church, parish, neighborhood, organizations, and community, never intruding or opposing, since, when all is said and done, it's in God we trust, not ultimately in government or politics." (For video of the Cardinal's complete remarks, one can go to http://www.patheos.com/blogs/deaconsbench/2012/10/video-cardinal-dolans-speech-at-the-al-smith-dinner/). The tradition of the two candidates appearing together at the Al Smith Dinner goes back to Kennedy and Nixon in 1960. It's a valuable tradition, which modifies the unedifying brutality of the electoral process. It also highlights, as did the Cardinal in concluding remarks, both the value of a vibrant network of religious and social institutions and community organizations and the indispensable benefit of Government. Lule the beloved physician sends greetings (Colossians 4:14). A Gospel is a work of art as well as a work of history. How fitting, therefore, that the Evangelist Luke, whose feast the Church celebrates today, should have been, according to tradition, a painter as well as an historian! The historian Luke tels us in the Prologue to his Gospel (Luke 1:1-4) how he decided, after investigating everything accurately anew, to write it down in an orderly sequence. The "everything" that he investigated was the events that have been fulfilled among us, just as those who were eyewitnesses from the beginning and ministers of the word have handed them down to us. Luke displays a genuine historian's sensibility in his approach, but even more so a pre-eminently ecclesial sensibility. The "events" must continue to be told in the community - even after the eyewitnesses from the beginning are gone. Hence the need for a Gospel to function as a perennial eyewitness. And Luke brings his considerable artistry to bear in telling the story for future generations. And not just one story - but two! Luke the historian recounts and Luke the painter portrays not just life and mission of Jesus but the life and mission of his Church, which continues Christ's presence and action in the world. The sequel to Luke's Gospel, The Acts of the Apostles, paints the picture of the providential growth and expansion of the Church - even in the midst of persecution - from a small Jewish sect in Jerusalem to a mixed Jewish and Gentile community based in the major cities of the Roman Empire and putting down roots even in the capital itself, Rome. In this age of so much spiritual individualism, when that nonsensical neologism "spiritual but not religious" has become so current, we do well to counter that by recalling Luke's parallel portraits of Christ in the Gospel and the Church in Acts - and the man himself who lived the Church-centered life he portrayed. The great missionary Saint Paul, who devoted his life to founding and nurturing local Church communities and their mutual communion with one another, cherished the community of collaborators on whom he relied and depended - among them Luke. It seems that Luke was often with Paul. (In today's reading from Paul's 2nd Letter to Timothy, we get to hear Paul lament that Luke was the only one with him at that juncture!). In his letter to the Colossians, Paul associates Luke's greeting to the faithful with his, calling him "the beloved physician." One supposes that medicine was what we would nowadays call Luke's "day job," when he wasn't writing scripture or otherwise heling foster Church community in the Gentile Roman world! But Paul wasn't just noting Luke's "secular" profession. He called him "the beloved physician." Perhaps Paul himself had used and benefited from Luke's medical expertise. But, above all, Paul seemed to value Luke as a companion. Because the life of faith is not just an individual career path, but a communal journey together through the world, Paul acutely appreciated his companions - fellow disciples like Luke. And so must we. Like Luke, we depend on our sources for the story we tell the world. Like Paul and Luke together, and like the Spirit-filled communities of faith Luke portrayed, we all depend on one another. We are our most "spiritual" when we are together. Some three decades ago, a friend me a story about her novitiate. One day all the sisters were given a “day off” from regular convent routine. Before going on their outing, that morning she recited the entire day’s Office (since the Sisters wouldn’t be reciting it together). Including Compline, I asked kiddingly? Yes, she answered. Even the Examination of Conscience, I asked? Yes, she said, since she knew already in advance what sins she would likely commit during the day! To me, Early Voting (which began today in Tennessee and started even earlier in some other states) is a bit like that. Enough potential voters (almost all of them, if the polls are to be believed) have already made up their mind that for most Americans the election might just as well be held today. Even so (as David Brooks observed recently), there certainly seems something strange about casting one’s vote before even the 1st Presidential Debate has taken place. It does seem to make the whole campaign/election process seem somewhat … ridiculous. To me, voting has always been primarily a symbolic civic ritual, which signifies a connection with and participation in the larger society, both national and local. Perhaps, I picked that up in elementary school civic class. Probably even more influential, however, was growing up watching my parents go to the polls on crisp autumn days – first, to register (back then when one had to register every time one planned to vote) and, later, to vote. Members of the “Greatest Generation,” my parents set a good example faithfully voting in every election. Rational Choice theoretical models that argue for the “irrationality” of voting notwithstanding, to my mind voting has always been mainly about participating in the process, bonding with my fellow-citizens, and adding legitimacy to whichever party gets the mandate to govern – all important things! But what about Early Voting? Can the symbolic resonance of participating in the electoral process survive being reduced to what seems like yet another convenience-store transaction? Of course, there can be good reasons for taking advantage of the convenience of Early Voting. Still, as with anything else that has - or once had - a communitarian context and significance, when we align the civic ritual of voting with individual timetables rather than a common calendar, do we perhaps run the risk of losing even more of what little we have left of a once vibrant civic culture? I was out of the country on the day of the Vice Presidential Debate and so didn't actually see it - although I've heard and read plenty about it since! (I just didn't consider it worth sacrificing an already fitful night's sleep to try to watch it at 3 a.m. Rome time!) I did, of course, watch the disastrous first debate, a presidential performance Andrew Sullivan has famously denounced as "so execrable, so lazy, so feckless, and so vain." Sullivan's hyperbole strikes me as accurate. But such hyperbole only raises the real question: why does it matter so much? Of course, ever since 1960, when JFK "won" his first debate with Richard Nixon because he looked better on TV (an interpretation confirmed by the fact that those who listed on radio thought that Nixon had "won" the debate), these presidential debates have been basically about showmanship. Had either the President or the moderator called Romney on his slick re-invention of himself in the last debate, he might not after all have emerged as the "winner" with "momentum," but there can be no doubt whatever that he looked and acted "presidential" and deservedly won the first debate's stature contest. But, again, given that the campaign has been going on - it seems like - forever, why should any one-time event make such a difference? Alec MacGillis has diagnosed the debate-mania malady in today's New Republic online. "Twitter has given political reporters all the more reason to exalt the debates as the highest test of aptitude. After all, isn't exchanging succinct points and parries how we now spend so much of our time, rather than being out talking to people in Dayton or digging into tax proposals or campaign finance rackets? The debates have become the Platonic ideal of campaigning for a glibly cynical couch-potato press: Just sit back and watch, laptop on the lap, iPhone and remote in hand, facile witticisms on the brain." 30+ years ago, when I was teaching political science at a midwestern university, one of my colleagues frustratingly described me and another colleague as having learned as part of our Ivy-League graduate education to substitute "witty apercus" for substance. What would he (rightly) say about the way the media covers the process by which the most powerful person in the world is elected? Of course, I too will be in front of my TV tonight for the second debate! 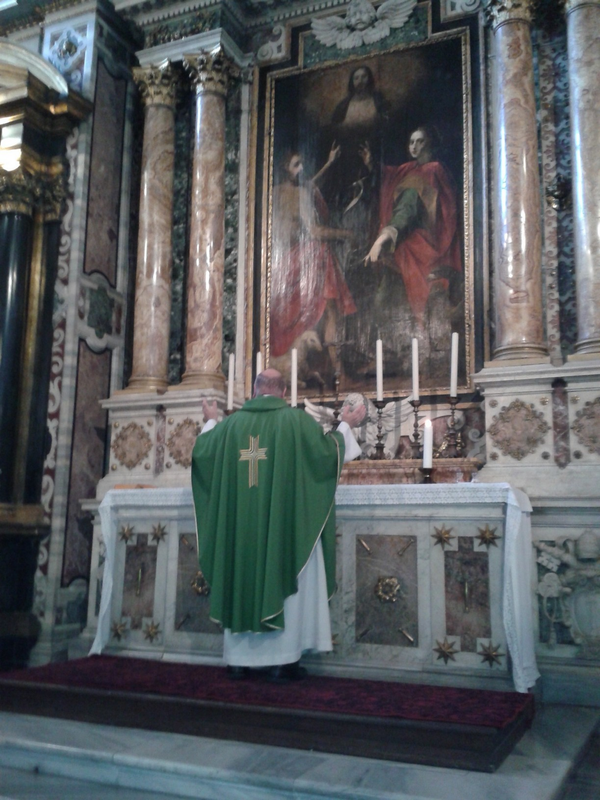 This post was written on Thursday, October 11, during a visit to the Paulist residence in Rome. For the past week, I have been accompanying a group (mostly parishioners from the Paulist Mother Church in New York) on a Year of Faith Pilgrimage to Rome and Assisi. I didn't have my laptop with me and we didn't stay in places with easy internet access, so this is my first (brief) comment on the experience. Tomorrow I fly back to New York and the next morning back to Knoxville! In Rome last Sunday, we attended the Papal Mass at St. Peter's for the solemn opening of the Synod of Bishops on the topic of the New Evangelization. The special highlight of that celebration was the elevation of St. John of Avila and St. Hildegard of Bingen to Doctors of the Church. Having recently compelted a course here in Rome with the Congregation of the Causes of Saints, It was especially interesting to attend this ceremony, which after all happens not that often. And St. John of Avila is an especially appropriate saint for the Church to celebrate as we embrace the challenge of the New Evangelization. The historic and religious sites we visited were all familiar to me already. 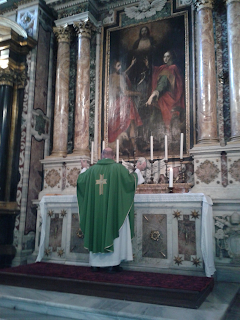 So for me the highlights (besides spending time with familiar friends from years past) were the Masses I was privileged to celebrate on Monday at St. John Lateran, on Tuesday at St. Paul's Outside the Walls, and on Wednesday in Assisi. These were moments of real grace for me as I look forward to this Year of Faith, which the Church begins today. I have gotten so used to going on line every day, to keeping up with the NYTimes and other political and news sites, I had wondered what it would be like to survive without them for a week. Well I've made it - none the worse for being out of touch and maybe a bit better off for having not heard anything about the presidential campaign for a week! We seem to be hearing a lot about “subsidiarity” lately. “Subsidiarity” is enshrined in Article 5 of the European Union Treaty, where it is specified that (apart from areas exclusively in its competence) the Union should not act in other areas unless its action would be more effective than action at the national, regional, or local level. Like most things European, however, “subsidiarity” has a longer history which predates the problematic European Union. It is commonly associated with the thinking of the 20th-century, aristocratic, German Jesuit Oswald von Nell-Breuning (1890-1991) and more famously with Pope Piux XI’s 1931 encyclical Quadragesimo Anno (which von Nell-Breuning is thought to have influenced.) In Quadragesimo Anno, Pius XI asserted that “every social activity ought of its very nature to furnish help to the members of the body social, and never destroy and absorb them” (Quadragesimo Anno 79). As I understand it, the operative idea underlying “subsidiarity” seems to be to maintain what I would prefer to label “zones of free activity within society" - lest an all-powerful State arrogate all activity to itself, leaving only itself and atomized individuals. That, of course, was what Thomas Hobbes (1588-1679) famously envisioned in his magisterial Leviathan - an outcome that was so effectively illustrated in the familiar frontispiece of the 1651 edition of Leviathan. Of course, Leviathan's all-popwerful sovereign was seen by Hobbes as a necessary remedy for the inevitable consequences of human individualism, which unchecked could only result in a war of all against all. It is, in fact, individualism which historically has weakened the power of organic communities and social associations, eventually producing a situation in which there is nothign between atomized indiviudals and the State. Whether it is right-wing, captialist, "free-market" indiviudalism or left-wing, lifestyle individualism, the result is similar. So "subsidiarity" makes serious sense as an argument against both excessive liberty and unlimited state power. An argument for limited government is not an argument against government. Whatever its current uses or misuses, “subsidiarity” is not about small government as a value in itself, but about limited government. That is, it is about government fulfilling its mission to “promote the general welfare,” in a way which complements, respects, and reinforces the roles, responsibilities, and activities of authentic human communities (among them families, churches, voluntary associations, etc.). The principle at the heart of this is that such “zones of free activity within society" - the authentic human communities experienced in families, churches, voluntary associations, etc. - contribute to human well-being in a fundamental and essential way. Therefore, it would be contrary to the common good of society to try to destroy such communities (as totalitarian systems typically try to do) or less directly to force them, in effect, out of business, something which governmental efforts to universalize an elite-group social agenda have already begun to do and may yet end up doing on a wider scale. At the same time, “subsidiarity” is certainly no argument for abandoning public activity on behalf of “the general welfare” to individual benevolence, as is sometimes strangely suggested. Philosophical considerations aside, the practical absurdity of that is evident. For example, Catholic Charities annually distributes billions of dollars in service to the poor, but much of that comes from government assistance of one sort or other. It is ideological mystification to suggest that the cuts some have proposed in government spending would simply shift such service to the poor from an alien government to private charities - and to label that “subsidiarity.” Rather, the most likely outcome would simply be a radical reduction in the ability of those charitable associations to act effectively on behalf of those they serve. Again the important value in all this is human well-being and the common good, both of which require the survival of such “zones of free activity within society" and a national government able to act effectively to “promote the general welfare.” Thus, for example, anticipating our contemporary experience of increasing inequality, Blessed Pope John XXIII wrote in 1963: “experience has taught us that, unless these authorities take suitable action with regard to economic, political and cultural matters, inequalities between the citizens tend to become more and more widespread, especially in the modern world, and as a result human rights are rendered totally ineffective and the fulfillment of duties is compromised. (Pacem in Terris, 63).